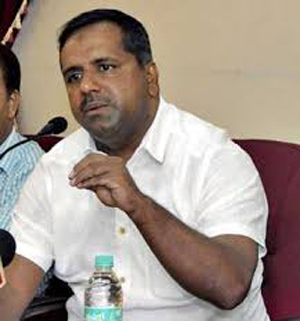 Mangaluru, April 29, 2016: Speaking at the annual convention of the association at Ravindra Kala Bhavan in University College, Karnataka Health Minister U T Khader gave his ascent to the Dakshina Kannada and Udupi District Association for Specially Abled to conduct a grievance redress meetings once in two months. He said all possible assistance will be given to the associations. The minister said he will put in efforts to solve the problems of the specially able. He called upon non-governmental organisations (NGOs) to publicise the government schemes meant for specially abled. The loopholes in the implementation of the schemes can be brought to his notice, he added. President of Vivekananda Adhyayana Kendra Vishweshwara Bhat Bangaradka said it is unfortunate that people, who are socially and economically stable, are availing benefits of the government schemes and added that it should be stopped. He sought a separate MLC seat for physically challenged. The specially abled face increased problems compared to other classes in the society. Hence, a rehabilation centre for specially abled should be opened in each taluk. The government should provide assistance to NGOs working in this direction, he added. Specially Abled and Senior Citizens’ Welfare Officer Annapoorna said the district has 28,000 specially abled people (seven per cent of the total population). Also, the number of mentally retarded persons is high in Dakshina Kannada district than other districts. The regulations to avail the benefits of government schemes have been simplified, he said. While allocating the grants, three per cent should be reserved for specially abled.